Add an Azure Blob storage account for DataStax Enterprise (DSE) OpsCenter backups. You can optionally specify sub folders within the storage container. Note: DSE OpsCenter does not support backing up to an Azure File Share. Important: Install Microsoft Azure CLI version 2.0.50. Do not install version 2.0.51 or later. These versions include a breaking change warning that causes OpsCenter backups to Microsoft Azure blob storage to fail. Alternatively, you can specify the Azure CLI version and the operating system distribution. For example, the following command installs Azure CLI version 2.0.51 for Ubuntu Trusty Tahr. See the installation instructions for your operating system for detailed procedures. Note: The required dependencies vary by Linux distribution. Install the dependencies listed for the distribution on every node where DSE is installed. Additionally, ensure that the Azure Blob storage account exists prior to adding a backup location in OpsCenter. Note: You must be the owner of the Azure storage account that you configure as an OpsCenter backup location. Select Microsoft Azure as the backup Location. Enter the Storage Account name that OpsCenter backs up to. Enter the Container Name, which is the name of the Azure Blob where OpsCenter saves backup data. Optional: Enter a Sub Folder that exists within the Blob storage container. If not specified, OpsCenter uses the root of the Blob storage container. Enter a Storage Key for the storage container, which is an access key for the storage account that houses the Blob storage container. 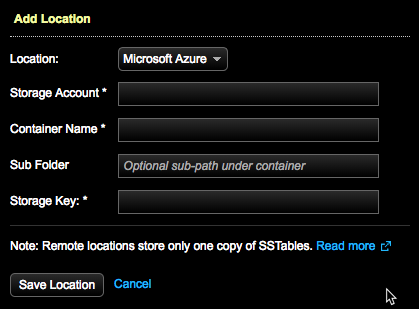 The specified Azure container is added as a backup location.